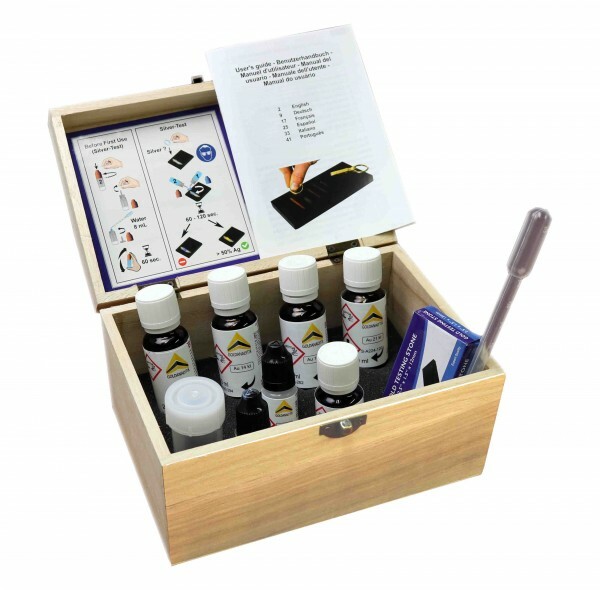 Product information "Gold, silver and platinum testing kit"
With our testing acids, you can reliably and quickly verify the authenticity of your gold, silver or platinum samples. The testing agents are produced and maintained by our professional chemists to steadily ensure the highest possible quality of our products. Our certified spatula cap allows an easy and convenient application of the testing solutions to the abraded gold material. After a short residence time, you will obtain a reliable evidence on the caratage of the sample's surface. Besides, our kit contains a patented system for silver testing which is free of the conventional and carcinogenic chromates (red liquid). For the first time, our silver test is therefore also permitted for private users. You will additionally receive a high-quality touchstone for perfect abrasion and contrast. In order to protect your health, the kit also contains a pair of gloves as well as top-quality safety glasses. Moreover, a detailed instruction manual for the handling of our testing acids is included. 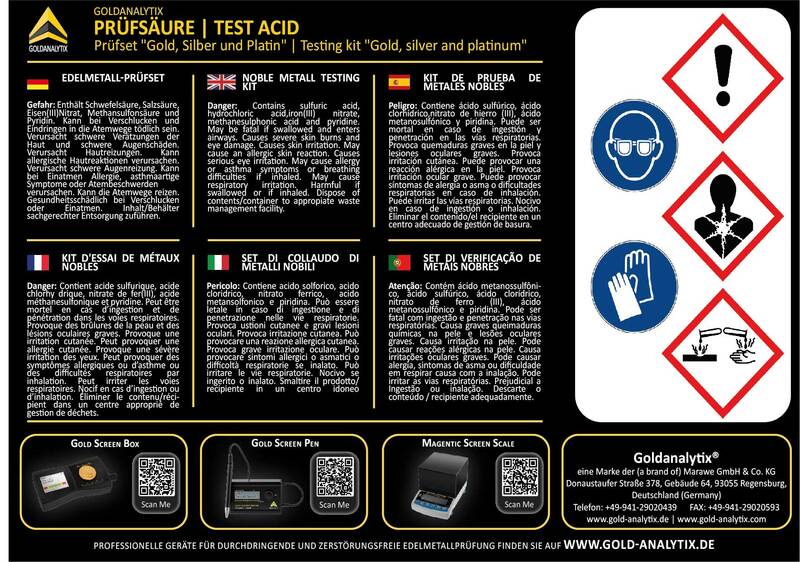 Related links to "Gold, silver and platinum testing kit"
Instruction manual for Goldanalytix Gold, silver and platinum testing kit as PDF file. Customer evaluation for "Gold, silver and platinum testing kit"